Keith Stoeber Network Administrator, Sioux Central, USA "Our bandwidth problems have been practically eliminated. Monitoring & customization is a snap with the web interface." Desert Academy, Santa Fe, USA "Other DNS vendors were either too expensive or inappropriate. We wanted an appliance that was easy to use and that’s what we got with DNSBOX." EDUGATEBOX is an all-in-one network appliance designed to get your school online easily, safely and at best value. With EDUGATEBOX you can enable cost-effective classroom internet and e-Learning anywhere, however remote – and give your students the chance to leapfrog a digital generation, even where bandwidth is a problem. 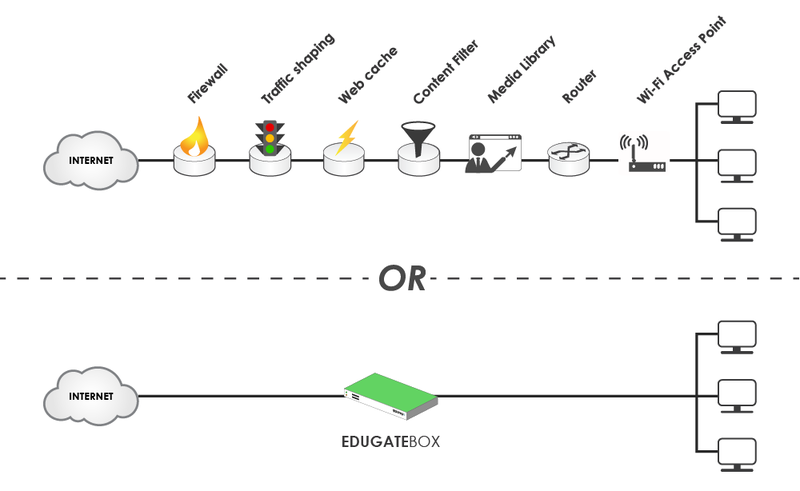 Designed specifically for schools in the early stages of enabling internet access, EDUGATEBOX offers just the right balance of features and functionality for a single classroom or anything up to 50 student devices. Everything needed, from routers to firewalls, from caching to traffic shaping is included in a single multi-function unit. From its simple intuitive interface any school can run a full service network, allowing their devices to safely connect to the network and access the internet, without having to understand the complexities of each on-board function. ApplianSys understands the complexities of delivering school networks and internet-enabled learning. We have partnered with schools and educational networks in 155 countries since 2001, to provide affordable, efficient and easy-to-use appliances. In choosing EDUGATEBOX schools are not simply buying off-the-shelf. They’re benefiting from a carefully developed schools solution – designed to take the stress out of getting students online.